The Round Rock ISD Board of Trustees approved the middle school boundaries, the schematic design of the District’s sixth comprehensive high school and received updates on the Citizens Bond Committee 2017 and Career and Technical Education (CTE) at its Nov. 17 regular Board meeting. Round Rock ISD also honored Board Vice President Pauline Law on her final meeting of her tenure. Round Rock ISD officials and fellow Board members honored Vice President Pauline Law for her service to the District since 2012. Law served as Place 7 on the Board of Trustees and completed her second term as vice president at the Nov. 17 meeting. Law served in leadership roles for several key initiatives during her tenure, including the Strategic Plan Design Team, the implementation of an Early College High School, the selection of Superintendent of Schools Dr. Steve Flores, the expansion of dyslexia services to support various learning styles, and the creation of a national model for instructional technology with NextGen Classrooms. As a result of the recent Board election, Mason Moses will serve as Place 7 on the Board of Trustees following Law. The Board approved the middle school boundaries, effective at the start of the 2017-2018 school year. The approved plan was amended from the Oct. 20 proposal presented at the Board meeting by RRISD staff. After community and Board input, the approved plan ensures Cedar Valley and Chisholm Trail middle schools will be under capacity. Pearson Ranch Middle School will not be subject to overcrowding within the forecasted 10 year period. All students from Fern Bluff Elementary School will continue to attend Chisholm Trail Middle School and all students from Old Town Elementary School will attend Walsh Middle School. The Northwoods at Avery Ranch subdivision and apartment complexes around Parmer Lane East of U.S. 183 will attend Pearson Ranch Middle School. Forest North Elementary School will also feed into Pearson Ranch. A majority of Joe Lee Johnson Elementary STEAM Academy and all Wells Branch Elementary Arts Integration Academy (AIA) students will attend Deerpark Middle School. A portion of students who reside north of Grand Avenue Parkway will attend Chisholm Trail Middle School. The Highland Horizons subdivision will stay at Cedar Valley Middle School. To better accommodate for growth at Pearson Ranch and allow for better demographic balance, the Ranch at Brushy Creek subdivision will be zoned for Cedar Valley. The Board approved the schematic design for the District’s sixth comprehensive high school, allowing the project to move forward with facility and curriculum planning. RRISD High School #6 is slated to be located on the District’s Pearson Ranch property, in direct proximity to England Elementary School, Pearson Ranch Middle School and the Transportation West facility. The campus will have the capacity to serve 2,600 students. Key components of the high school include 850 square feet of instructional space, collaborative spaces throughout the school and a centralized media center as the campus’ hub. The campus will be designed with energy efficiency, long-term durability and minimized ongoing maintenance in mind. 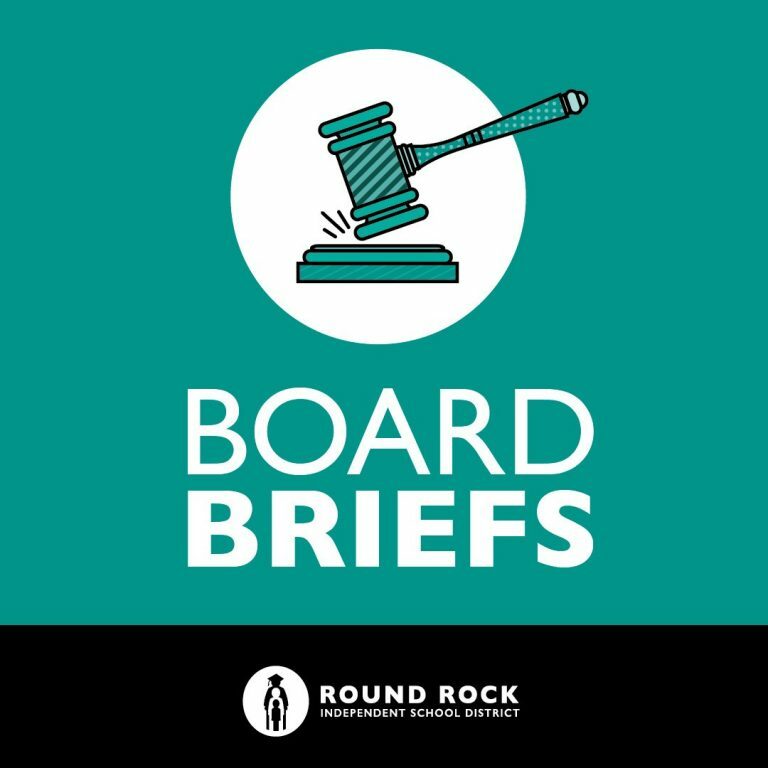 The Board heard an update on the Round Rock ISD Citizens Bond Committee (CBC), which has met three times to prioritize needs, aligned with the District’s Strategic Plan and financial implications of a May 2017 Bond Election. As of the latest meeting Nov. 15, two subcommittees finalized the prioritization of projects and the Finance Subcommittee will now work to create its proposal for a potential May 6, 2017, bond election, which could include a sixth high school, two elementary schools, an additional outdoor varsity athletic complex, an aquatics center, a CTE High School, and completed master plans at C.D. Fulkes Middle School, McNeil, and Westwood high schools. The Innovation and Safety Subcommittees reached a point where they could begin prioritizing projects within their scopes, allowing for the creation of a recommendation to present to the CBC Advisory Committee. The Finance Subcommittee discussed different scenarios and the potential tax and debt impacts in those scenarios. Their recommendation is also being created for committee review. The Growth Subcommittee discussed some of the larger new facility needs of the District. They will continue to tour facilities and meet to further their progress. To review all materials and presentations from the meeting, please visit bond.roundrockisd.org. Sheri Bonds, Round Rock ISD director of CTE, and five high school CTE students presented on the impact of CTE programs within the District. CTE classes offer students the opportunity to begin career training in high school while reinforcing state and national academic standards. CTE classes in Round Rock ISD span 17 campuses and thousands of students under 14 career clusters. More than 100,000 CTE courses are led by more than 160 instructors.